The morning was busy with OT and RT, lunch in the afternoon, and then it was time for the family meeting. The first moment was a little nerve-racking, when I walked in, and there were 8 staff sitting around a big table, with all eyes on me. I managed to squeak out a soft "hi"...awkward. After the next breath, all was good again. The social worker explained a few things and the meeting started. After each member of the team would speak, they would ask if I had any questions. It was decided that I ask a lot, because for the most part I didn't have any, I had already asked them all :) It was funny because as each person was speaking, they were looking at me and thinking the same thing I was-we've already talked about this. That's okay though, awkward times are good! Haha. We were supposed to talk about where they see Cale is at and what the next little while will hold for us, but decided that they all agreed it was too early to know with him. I'm thinking this might be because of the cold? Not sure. After everyone was done speaking, the doctor asked if I had anything to add. I talked about what I see as the next 3 stepping stones: 1) Swallowing/getting to eat real food 2) Voice-I really want to hear it! 3) Control bladder-this would just be really nice... :) and than of course I mentioned my overall goal is to get Cale back home with me!! VERY much wanted! I also talked about wanting to get to the point of trust. I know that we've only been here a week; I'm still learning them and they're still learning me. I've been really missing the staff at Wake. All the things Cale has been doing, I wish they could see and be a part of. I keep picturing getting to tell them and wanting to call a million times a day to tell them every detail. I want that again here. I want the staff here to get to the point that they can trust me when I point something out about Cale (like how he's had a cold) and I want to be able to trust them with how they're doing things with him. I think so far it's good and I see that both ways, but again, it's that stage of learning. Last thing...well, maybe! 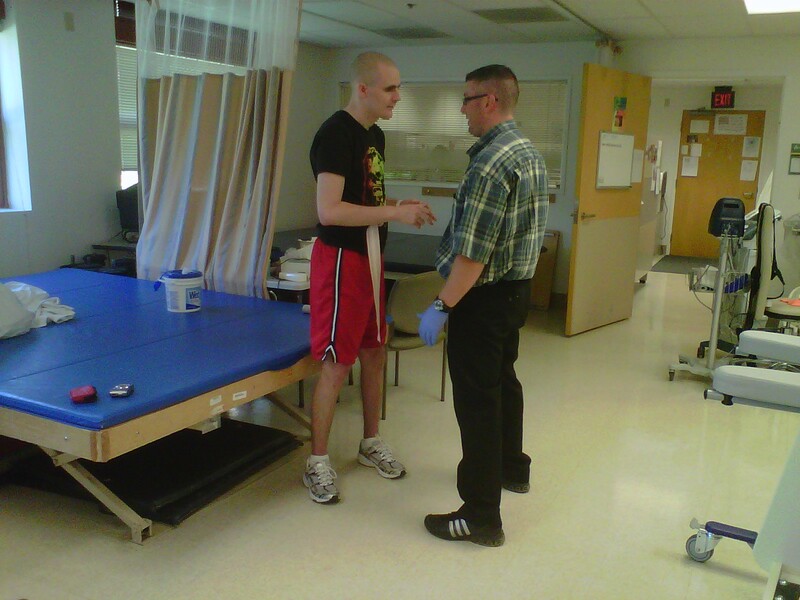 In PT today, Cale did so much! He did some balancing, walking with a walker, time on the bike, AND...he stood! It was for at least 30 seconds all by himself! Yes! He still has trouble getting the full balance, but he was standing!! Cale and I are not only working on physical strength for him, but we also need to be able to stand firm in our faith through the good, the bad, the hard, the easy, and everything in between. The only way for this to be possible is for us to dig in to God's word TOGETHER everyday, and seek wisdom and grow more intimate with the Lord. It gets hard to do when the days get so busy with therapy's and meetings but we want life-life in Him. That's hilarios. I LOVE!!! that picture of him standing. It actually looks like he is talking to that guy. That will happen again someday friend. Sounds like they are doing what needs to be done. And hey in a couple of months maybe more you and Cale can walk into Wake Med. What a treat that will be Kathleen. As I was reading you blog for today, I had the radio on on my computer and one of the songs from your wedding, Amazing Love, played as SOON as I scrolled down to see the beautiful picture of you and Cale in the Word together!! :) So fitting, I thought. We love you both so much and are continuing to pray for both of you. OH! And by the way, the picture of Cale standing by himself.....PRICELESS!! Cale looks just like he did before in that photo...! Handsome and strong, just like a soldier!! Such hope...I love you and I am praying daily for you both....!! Ah, I know what I'm going to pray for next! That Cale will laugh! :D With his new smile that comes peeking out (and praying it will come more and more), I'm praying that he will be able to understand and express humor and laughter. What a blessing those things are and I often take that for granted. Thanks for helping me appreciate things I often forget to be thankful for! That picture of Cale standing unsupported - on his own - wow, that is really WONDERFUL! How exciting! I'm just always so excited for you both. But, like you said, more important than anything else is that we are rooted in Christ. HE IS OUR TREASURE, our REWARD, our JOY, our PEACE, our SATISFACTION, COMFORT, and CONTENTMENT. Keep digging in TOGETHER. I'm so very happy to hear that you're both having devotions and quiet times together. How precious! Me again, Just dropping by to tell you that you both are on my mind and I am praying for you. Hope Cale is feeling better today. And you are getting EXCELLENT sleep. 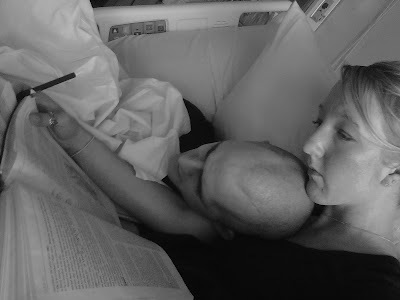 I love that picture of you two with Cale with his head on your shoulder listening as you read...The Good News. I hope you got my package today. I love you darling.